It is in the User Groups tab where you can view and manage the permissions and data sync rules for user groups. R01 Items used as Reserved Materials on Service Calls where the technician has been responsible / assigned. R13 Sync only Items that belong to a branch the current user is assigned to. R23 Sync only Warehouse that belong to a branch the current user is assigned to. RO2 Business Partners that are associated with Activities and/or Service Calls where the technician has been responsible / assigned. RO2a Addresses that are associated with Activities and/or Service Calls where the technician has been responsible / assigned. RO2b Contacts that are associated with Activities and/or Service Calls where the technician has been responsible / assigned. RO3 Business Partners for own Branches. and, it has a common branch shared with him. R04 Equipment that is associated with Activities and/or Service Calls where the technician has been responsible / assigned. R14 All Equipment of Business Partners for own Activities and/or Service Calls. Sync only Equipment that belong to a Customer who has issued at least on Service call, or one Activity, for which the current user is the responsible. R15 Sync only sales opportunities associated with the business partner belongs to a branch the current user is assigned to. R16 Sync only Incidents issued by Business Partners for which at least one Activity and/or Service Call has the current user set as responsible. R17 Sync only Defects issued by Business Partners for which at least one Activity and/or Service Call has the current user set as responsible. R18 Sync only Payment Terms issued by Business Partners for which at least one Activity and/or Service Call has the current user set as responsible. R19 Sync only Sales Opportunities issued by Business Partners for which at least one Activity and/or Service Call has the current user set as responsible. R20 Sync only Sales Quotations issued by Business Partners for which at least one Activity and/or Service Call has the current user set as responsible. R21 Sync only Sales Orders issued by Business Partners for which at least one Activity and/or Service Call has the current user set as responsible. R22 Sync only Service Contracts issued by Business Partners for which at least one Activity and/or Service Call has the current user set as responsible. R24 Sync only Sales Quotations for which the Business Partner belongs to a branch the current user is assigned to..
R25 Sync only Sales Orders issued by Business Partners that belong to a branch the current user is assigned to. R26 Sync only Service Contracts issued by Business Partners that belong to a branch the current user is assigned to. and, the number of days between NOW and its last change date is bigger than a configurable number. R28 Sync only Sales Opportunities issued by Business Partners for which at least one Activity and/or Service Call has the current user set as responsible. R32 Invoices for own branches. R33 Sales Quotations for own Branches. R34 Sales Orders for own Branches. R36 Own Invoices and Territory invoices. or, shares a common Territory with the Business Partner that issued it. R06 Previous Service Calls open for Equipment on which technician is currently assigned to work, providing a service history (historical data of work completed on Equipment).This enables the technician to view relevant Equipment service details without needing to sort through past Service Call records. R07 Service Calls handled in the last six (6) months, where the technician was responsible / had previously been assigned. R08 Service Calls where the technician is responsible / has been assigned. R09 All Activities that are associated with Service Calls where the technician has been responsible / assigned. R10 Previous Activities performed on Equipment for which technician is currently responsible / assigned to work, providing a service history (historical data of work completed on Equipment).This enables the technician to view relevant Equipment service details without needing to sort through past Service Call records. R11 Activities performed within the last six (6) months, where the technician was responsible / has previously been assigned. R12 Activities where the technician is responsible / has been assigned. R37 Activities for the technician's team. where the technician is responsible / has been assigned. OR where the technician belongs to the same team which is linked to the project of the activity. R38 Activities for the technician's team and skills. R23 All Activities that are associated with Service Calls where the technician has been responsible / assigned. R51 Checklist Instances on Activities for the technician. Reduces the volume of Checklist instances sent to the device. Checklist instances on activities will only be sent where the person is responsible / assigned for checklist instances, activities or associated service calls. R43 People who are linked to the same team(s) as the technician's team(s). R50 Attachments on Activities for the technician. Reduces the volume of attachments sent to the device. Attachments on Activities will only be sent where the person is responsible / assigned for Activities or associated service calls. Attachments not linked to an activity will not be affected by this rule, they will be downloaded based on permissions. R52 Addresses on Activities for the technician. Reduces the volume of Addresses sent to the device. Addresses on Activities will only be sent where the person is responsible / assigned for Activities or associated service calls. R53 Contacts on activities / service calls for the technician. Reduces the volume of Contacts sent to the device. Contacts on Activities / Service Calls will only be sent where the person is responsible / assigned for activities or associated service calls. Data Sync Rules are used to control what information is stored in the mobile application for offline use. They can decrease bandwidth used while syncing technician devices. They can decrease application memory usage on mobile devices. They can improve equipment and item search, as less irrelevant data is filtered out. They can help streamline communication between technicians and the back-office, and ensure that technicians only receive the data they need, when they need it. Attention: Please note that Data Sync Rules do NOT represent a security measure, as they do not impact the web-based applications and the Data API. They are merely used to improve performance and data integrity for the mobile application. Name The name of the user group. This name is entered when creating a new user group. Description The description of the user group. This description is entered when creating a new user group. Created The date/time at which the user group was created. Updated The last date/time at which the user group was updated. Data Sync Rules All data sync rules that have been applied to the user group. Refer to the Data Sync Rules section for more information. By selecting the quick view icon, you can view all permissions/UI permissions associated with supported objects. Permissions for user groups can be managed at Users > User Groups by clicking on a User Group record and selecting the edit option. Based on the object type selection, the UI Permissions values will change. 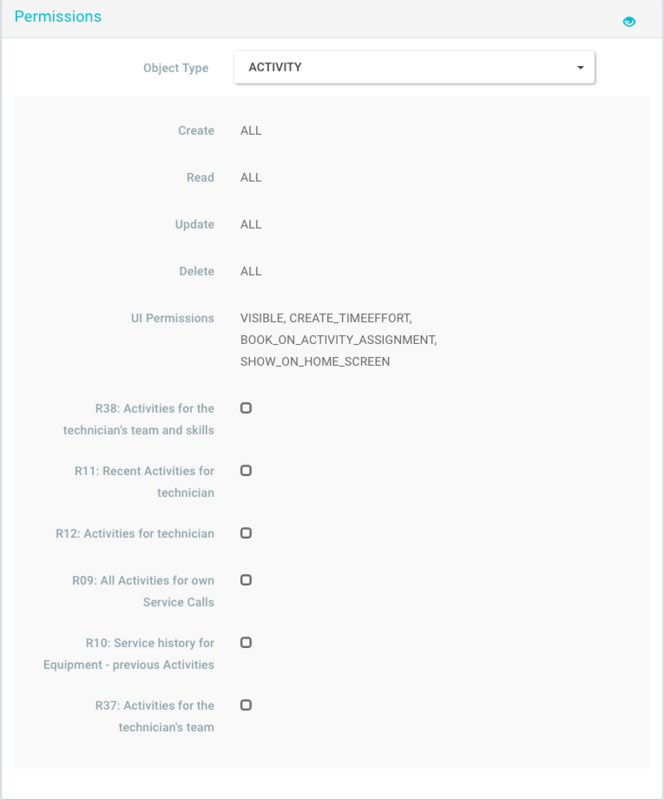 Based on the object type selection, the available (if any) sync rules (example R38: Activities for the technician's team and skills) will change. Create The ability to create a new record of the selected object type. Options include ALL, OWN, and NONE. Please refer to the CRUD Operators section for more information. Read The ability to view a record of the selected object type. Options include ALL, OWN, and NONE. Please refer to the CRUD Operators section for more information. Update The ability to update a record of the selected object type. Options include ALL, OWN, and NONE. Please refer to the CRUD Operators section for more information. Delete The ability to delete a record of the selected object type. Options include ALL, OWN, and NONE. Please refer to the CRUD Operators section for more information. UI Permission Any/all UI permissions associated with the object. [ Data Sync Rules] Based on the selected object type, there may be sync rules that can be applied to improve synchronization times and database size. Please refer to the Data Sync Rules section for more information. When creating a new user group, the new user group will initially take the default permissions. These permissions can be viewed byt selecting the option in the User Groups view. The new user group will now be visible in the user groups view and can be managed by selecting it and adding/modifying permissions as required. User group permission settings can be downloaded to JSON format by selecting the download option and then selecting the user group you wish to download from the user group dropdown. Note: The below example does not represent a complete file. By contrast, you can update an existing user group or create a new one using the Upload option. 1 If a user group with a given name exists it will be updated, otherwise a new user group will be created. 2 The format must be the same available as that used when downloading a user group record. 3 The file must be in JSON format. Select the option from the User Groups view. Name Required. The name of the user group. If the name already exists, the user group record will be updated. Description The description of the user group. File Select the file to upload from your local computer. When complete, click the Upload button below. And then select the option. The record will then be deleted. If you check this box, the users can create Efforts/Materials/Expenses/Mileages on Activities of type Assignments. If you check this box, the users can create Efforts/Materials/Expenses/Mileages on Activities of type Notes. If you check this box, the users can create Efforts/Materials/Expenses/Mileages on Activities of type Phone Call. Check this option to display the assignments on the Home screen. If this option is not checked, the technician will not see any assignments on the Home screen. If you check this box, the users can create Efforts/Materials/Expenses/Mileages on Activities of type Meeting. If you check this box, the users can create Efforts/Materials/Expenses/Mileages on Activities of type Other. If you check this box, the users can create Efforts/Materials/Expenses/Mileages on Activities of type Task. If you check this box, the Activities module will appear in the menu of Coresystems Field Service Mobile. If you do not check this, the Activities module will not appear in the menu of Coresystems Field Service Mobile. However, Activities linked to a Service Call, for example, will still appear. *You must first define the main settings under Effort/Expense/Material/Mileage. This permission is the base for the task configurator. The task configurator is only available on request. If you check this box, the Task Template module appears in the Task Configurator on my.coresuite.com. If you do not check this, the Task Template module is not visible in the Task Configurator on my.coresuite.com. If you check this box, the “Alerts” module will appear in the menu of Field Service Mobile. If you do not check this, the “Alerts” module will not appear in the menu of Field Service Mobile. If you check this box, the “Approvals” module will appear in the menu of Field Service Mobile. If you do not check this, the “Approvals” module will not appear in the menu of Field Service Mobile. If you check this box, already approved Approvals will still be visible. If you check this box, already cancelled Approvals will still be visible. If you check this box, “Attributes” will appear in the Task configurator module in my.coresuite.com. If you do not check this, “Attributes” will not appear in the Task configurator module in my.coresuite.com. Attribute Value This permission is related to the Attribute permission and is only available in the task configurator. The task configurator is only available on request. If you check this box, the Business Partners appear on the Planning & Dispatching Map. If you check this box, the “Business Partners” module will appear in the menu of Field Service Mobile. If you do not check this, the “Business Partners” module will not appear in the menu of Field Service Mobile. However, Business Partners linked to a Service Call, for example, will still appear. * You must first define the main settings under Effort/Expense/Material/Mileage. If you check this box, “Dispatcher Reminders” will appear in the Service Call/Activty Details section of the Planning & Dispatching app. If you do not check this box, “Dispatcher Reminders” will not be displayed in the Planning & Dispatching app. If you check this box, the “Smartforms” module will appear in the menu of Field Service Mobile. If you do not check this, the “Smartforms” module will not appear in the menu of Field Service Mobile. If you check this box, the user can create Smartforms on Activities. If you check this box, the user can create Smartforms on Business Partners. If you check this box, the user can create Smartforms on Equipments. If you check this box, the user can create Smartforms on Opportunities. If you check this box, the user can create Smartforms on Quotations. If you check this box, the user can create Smartforms on Sales Orders. If you check this box, the user can create Smartforms on Service Calls. Contains general company information (e.g. company logo) in reports. If you check this box, the Company information is displayed in my.coresuite.com > Settings. If you don’t check this box, the Company Information is not displayed in my.coresuite.com > Settings. If you uncheck this box, the Company Settings (Service Call Status Mappings and Miscellaneous Mappings) will not be visible in the Planning & Dispatching. If you check this box, the “Contacts” module appears in Field Service Mobile. If you do not check this, the “Contacts” module does not appear in Field Service Mobile. Approvals (this permission is a prerequisite for using the Approvals module). If you check this box, the device sends the location whenever the user creates an Effort. If you check this box, the Effort will be rounded to the next 15 minutes in the Planning & Dispatching. If you do not check this box, the Efforts will not be rounded in the Planning & Dispatching. If you check this box, the “Efforts” module will appear in the menu of Field Service Mobile. If you do not check this, the “Efforts” module will not appear in the menu of Field Service Mobile. However, Efforts linked to an activity, for example, will still appear. If you check this box, the “Employees” module will appear in the menu of Field Service Mobile. If you do not check this, the “Employees” module will not appear in the menu of Field Service Mobile. However, Employees linked to a Service Call, for example, will still appear. If you check this box, the UDFs on the Employees are displayed in Field Service Mobile. If you check this box, “Reservation Types” will appear in the Planning & Dispatching under Settings > General. If you do not check this box, “Reservation Types” will not appear in the Planning & Dispatching under Settings > General. If you check this box, the “Equipments” module will appear in the menu of Field Service Mobile. If you do not check this, the “Equipments” module will not appear in the menu of Field Service Mobile. However, Equipments linked to a Business Partner, for example, will still appear. If you check this box, the user can create a Service Call and select an Equipment unrelated to the business partner. If you check this box, the user can see/use the hierarchy tab for Equipments. If you check this box, the “ERP Errors” module appears in my.coresuite.com. If you check this box, the “Expenses” module will appear in the menu of Field Service Mobile. If you do not check this, the “Expenses” module will not appear in the menu of Field Service Mobile. However, Expenses linked to a Service Call, for example, will still appear. Attention: Here you make the main setting for Expenses. You can then do the fine-tuning by checking/unchecking the checkbox “Create Expense” in the following modules: Activity, Business Partner, Opportunity, Quotation, Sales Order, Service Call and Time Project. If you check this box, the “Items & Stock” module will appear in the menu of Field Service Mobile. If you do not check this, the “Items & Stock” module will not appear in the menu of Field Service Mobile. However, Items linked to a Sales Order, for example, will still appear. If you check this box, you will not be able to book Material if the quantity is not greater than 0. If you check this box, you can edit the Unit Price when you create a Material. If you check this box, Field Service Mobile expects a barcode scanner to be attached to the device and then function "Create Materials" is displayed in the menu. If you check this box, the Equipment chooser is mandatory if you create a Material. If you check this box, you can create negative quantities on Materials. Note: Here you make the main setting for Materials. You can then do the fine-tuning by checking/unchecking the checkbox “Create Material” in the following modules: Activity, Business Partner, Opportunity, Quotation, Sales Order, Service Call and Time Project. Note: Here you make the main setting for Mileages. You can then do the fine-tuning by checking/unchecking the checkbox “Create Mileage” in the following modules: Activity, Business Partner, Opportunity, Quotation, Sales Order, Service Call and Time Project. * You must first define the main settings under Effort. If you check this box, the option “Request Prices” becomes available on Quotations. If you check this box, the users can edit the overall discount on a Quotation. If you check this box, the users can edit the base price of an item in the Quotation. If you check this box, the users can edit the discount on an item in the Quotation. If you check this box, the users can edit the name of an item in the Quotation. If you check this box, the “Quotations” module will appear in the menu. If you do not check this, the “Quotations” module will not appear in the menu. However, if you go to a Business Partner, for example, the Quotations linked to that Business Partner will still be displayed. If you check this option, the “Reports” module will appear in the menu of Field Service Mobile. If you do not check this option, the “Reports” module will not appear in the menu of Field Service Mobile. If you check this box, the user can do a checkout with left-over Reserved Material. If you check this box, the “Opportunities” module will appear in the menu of Field Service Mobile. If you do not check this, the “Opportunities” module will not appear in the menu of Field Service Mobile. However, if you go to a Business Partner, for example, the Opportunities linked to that Business Partner will still be displayed. If you check this box, the Warehouse of the Sales Order Item will automatically be filled with the Warehouse of which the user is the owner. If you check this box, the option “Request Prices” becomes available on Sales Orders. If you check this box, the users can edit the overall discount on a Sales Order. If you check this box, the users can edit the base price of an item in the Sales Order. If you check this box, the users can edit the discount on an item in the Sales Order. If you check this box, the users can edit the name of an item in the Sales Order. If you check this box, the users can edit the Payment Term in the Sales Order. If you check this box, the users can edit the Payment Type in the Sales Order. If you check this box, the users can edit the Shipping Type in the Sales Order. If you check this box, the “Sales Orders” module will appear in the menu of Field Service Mobile. If you do not check this, the “Sales Orders” module will not appear in the menu of Field Service Mobile. However, if you go to a Business Partner, for example, the Sales Orders linked to that Business Partner will still be displayed. If you check this box, the user can create Activities of type Assignment on the Field Service Mobile, otherwise those types will be created only in the Planning & Dispatching. If you check this box, the user can edit Activities of type Assignment on Field Service Mobile, otherwise those types will be edited only in the Planning & Dispatching. In order to be able to create a Service Assignment Status, you must have Read permissions on Service Assignment Status Definition. If you tick this box, “Assignment status” will appear under my.coresuite.com > Service calls. If you check this box, the “Service Calls” module will appear in the menu of Field Service Mobile. If you do not check this, the “Service Calls” module will not appear in the menu of Field Service Mobile. However, if you go to a Business Partner, for example, the Service Calls linked to that Business Partner will still be displayed. If you check this box, the user can do a group checkout. This is default value for the checkbox “Checkout without Report”, which is displayed during the checkout process on Field Service Mobile. If this checkbox is checked, the checkout will be made without report, otherwise with a report. This checkbox defines whether “Checkout without report” (see above) is displayed on the UI. In order to view Service Contracts from the Master Data Management app, the visible checkbox in the advanced settings must be checked. Note: If you set Read to All, you must also set the Read permission of Service Contract Equipment to all. Note: in order to create Signatures the user must also have Create permissions on Ratings. Note: in order to be able to use this, you must also have the permissions for Reserved Material. If you check this box, the users can create Visitor Reports on Business Partners. If you check this box, the Worktime Type “Presence” will be used as default. If you check this box, the “Work Time” module will appear in the menu of Field Service Mobile. If you do not check this, the “Work Time” module will not appear in the menu of Field Service Mobile. If you check this box, the "Employee Department" field will appear in the mobile application when an employee record is selected. If you do not check this, the "Employee Department" field will not be visible. If you check this box, the "Employee Position" field will appear in the mobile application when an employee record is selected and in the Planning & Dispatching application. If you check this box, the "Inventory" field will appear in the mobile application when an Item record is selected and in the Planning & Dispatching application when . If you do not check this, the "Inventory" field will not be visible. Note: if project has read-only permission, the option to dispatch activity will be grayed out for the Project Management user. Skills This is used to associate requirements with a service call/activity. The service call/activity could then only be completed by a technician who has been tagged with the corresponding skills. This is used to make fields required/mandatory. If you check this box, the "Shipping Type" field will appear in the mobile application when a sales order is created. If you do not check this, the "Shipping Type" field will not be visible. Note: this setting is used to enable the skills feature used in the Master Data Management and Planning & Dispatching applications. This is used for tagging/associating skills with technicians. When, for example, a service call and/or activity has requirements associated with it, only a technician who has been tagged with corresponding skills could be assigned. Translation my.coresuite.com A central place for storing everything that can be translated. If you check this box, the "currency" field will appear in the Planning & Dispatching application. If you do not check this, the "currency" field will not be visible. Note: this setting is ONLY available for users operating Field Service Management as a standalone solution without an ERP in the background. This setting is used to enable the Payment Terms field to appear in the sales order report. This permission setting is used to enable and manage the Business Rules & Notifications functionality, with which you can specify application actions to occur (such as sending an SMS message) when certain conditions have occurred. Service Call Type Planning & Dispatching (standalone) This setting is used to view and manage the Service Call Type field. This setting is used to enable the usage feature in the Sales Order module of the mobile application. Plugin A plugin can be any JS UI widget. Project Project Management This setting is used to enable/limit the usage of the Project Management app. Note: The Project Management app is available to Global license holders. Project Phase Project Management This setting is used to enable/limit the creation of project phases and subphases for a Project. Purchase Order Field Service Mobile This setting is used to enable the Purchase Order functionality in the mobile application, which is used to manage the product and service purchases from external suppliers. Planning & Dispatching This setting is used to create and manage work time patterns that are assigned to employees. Work time patterns will display on the planning board of the Planning & Dispatching app. UDO Value Admin > Custom Objects This setting is used to create and manage custom objects and custom fields. Competitor Product Field Service Mobile This setting is used to create and manage competitor product pricing information in the mobile application. Crowd Assignment Marketplace This setting is required to use the Crowd Service and Marketplace features in Coresystems Field Service Managmement and assign service calls and activities to crowd service partners. This setting is by default ALL when the Crowd License has been purchased. Crowd Assignment Marketplace This setting is required to use the Crowd Service and Marketplace features in Coresystems Field Service Managmement and create, manage, and view crowd service partners. This setting is by default ALL when the Crowd License has been purchased. Crowd Execution Record Marketplace This setting is required to use the Crowd Service and Marketplace features in Coresystems Field Service Managmement and create, manage, and view the execution record of service calls and activities completed by crowd service partners. This setting is by default ALL when the Crowd License has been purchased. Crowd Person Marketplace This setting is required to use the Crowd Service and Marketplace features in Coresystems Field Service Managmement and create, manage, and view the technicians created by the crowd service partners to whom service calls and activities can be assigned. Crowd Persons are created when completing the crowd service partner registration process. This setting is by default ALL when the Crowd License has been purchased. Crowd Person Availability Marketplace This setting is required to use the Crowd Service and Marketplace features in Coresystems Field Service Managmement and create, manage, and view the availability of crowd service partners and their technicians. This setting is by default ALL when the Crowd License has been purchased. Crowd Skill Marketplace This setting is required to use the Crowd Service and Marketplace features in Coresystems Field Service Managmement and create, manage, and view skills assigned to technicians by crowd service partners. This skills are selected and applied when completing the crowd service partner registration process. This setting is by default ALL when the Crowd License has been purchased. Team Project Management This setting is required to view, create, and manage Teams in the Project Management app. Teams consist of two or more technicians, and can be assigned to a project and its related activities.